The John Johnson Collection participates in a scheme run by Oxford University’s Department of Art History, through which students can gain experience of the curation of collections. We have been fortunate to welcome Nina Foster, who has been working on posters in the First World War. Throughout 2015, the John Johnson Collection will remember the First World War through the plethora of propaganda posters and postcards in the collection. While many of the posters were directed towards young men, encouraging them to enlist to the army immediately, there were also many posters aimed at women. The First World War offered some women their first opportunity to have a job, which would set a precedent for women’s rights campaigns throughout the early twentieth century. 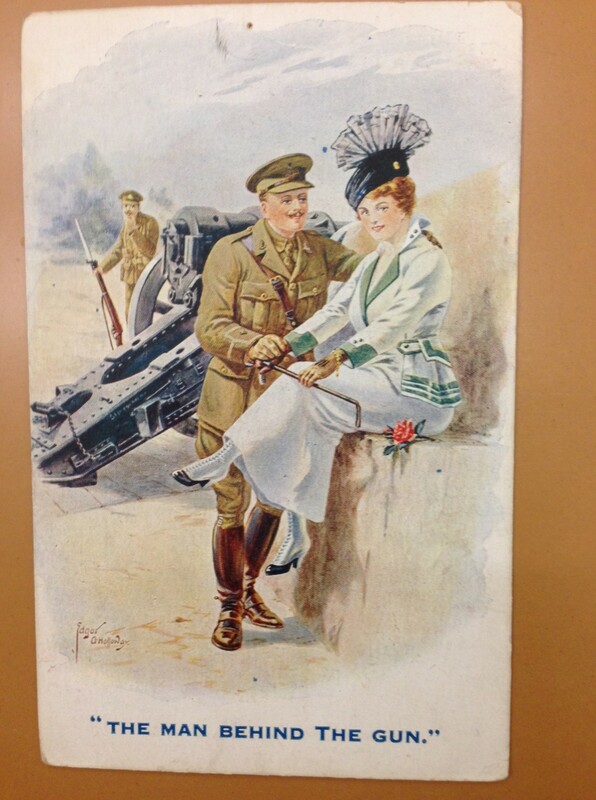 The images of women in WWI posters reveal the tension between the need for women to work “like men” during the war and the desire for them to remain true to the Victorian ideal of a feminine woman. The poignant slogan (used by the Queen Mary’s Auxiliary Corps among others) “The Girl Behind the Man Behind the Gun” pointed to the importance of women during the First World War but who that girl really was, or should have been, remained ambivalent. 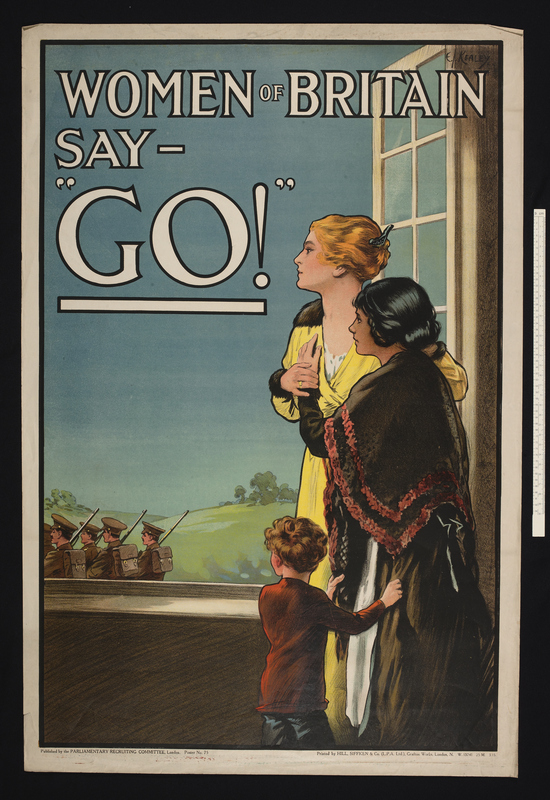 Some posters, such the famous “Women of Britain say GO!” depict women as timid, frightened and almost trapped in the home while their husbands went off to the front line. The young boy clutching on to the skirt of his elder sister who in turn embraces her mother for support, drives home the message that women and children could be taken together as helpless victims of the war who needed to be protected by men. No doubt this was a successful persuasive tactic from the propaganda poster companies for encouraging men to fight but it proved to be an unsustainable way of depicting women as their position in society changed throughout the war. As Diana Condell and Jean Liddiard note in their book Working for Victory: Images of Women in the First World War, the war presented an opportunity for women to go beyond the traditional feminine role and to gradually immerse themselves in the public sphere. However the prospect that women could now do the same jobs as men posed problems for the idea that women were powerless and in need of protection from the war. How could a woman be both helpless and helpful for the war at the same time? It would seem that as the war progressed, posters were asking women to do both, arguably an impossible combination. 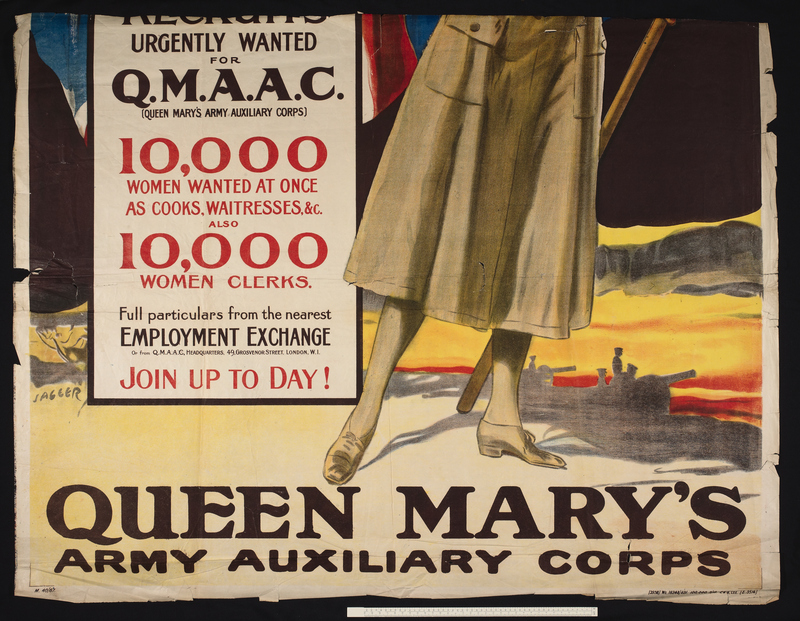 Posters now began to show women in masculine, military style uniform looking confident, commanding and self-assured such as the flag-wielding woman of the Queen Mary’s Army Auxiliary Corps recruitment poster. 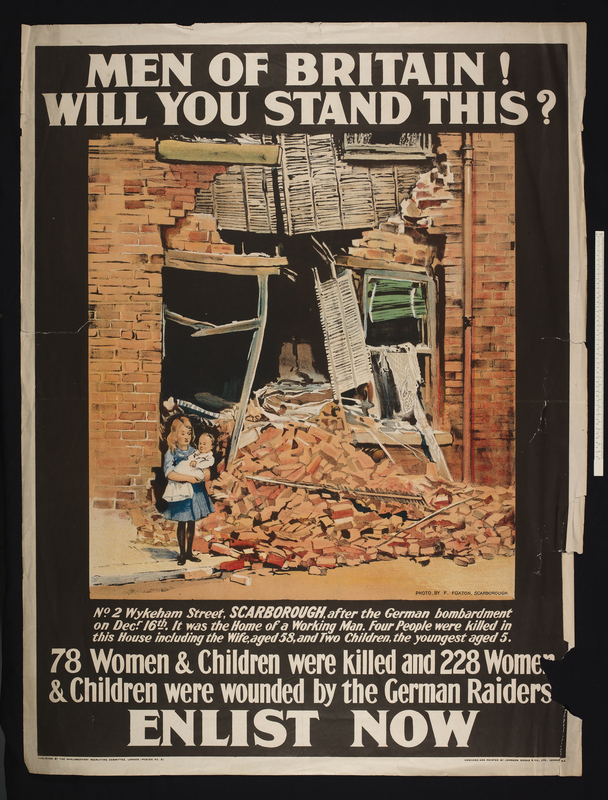 This poster claims that to join the QMAAC was “the Supreme test of British Womanhood”, a decidedly different take on womanhood than can be seen in a contemporary poster depicting the horrors of the bombing of Scarborough. Here women are grouped with children as defenceless victims of German evils and the poster resonates visually as well by depicting a young girl holding a baby. It is clear that posters from this era expected two very different things from contemporary women; on the one hand they had to be weak, guardians of the home, the very thing that men were fighting to protect and on the other hand they had to play their part in the war, to do the jobs men had left behind even if it meant abandoning their traditional “feminine” role. This clash of ideals prompted the production of some very strange propaganda posters. 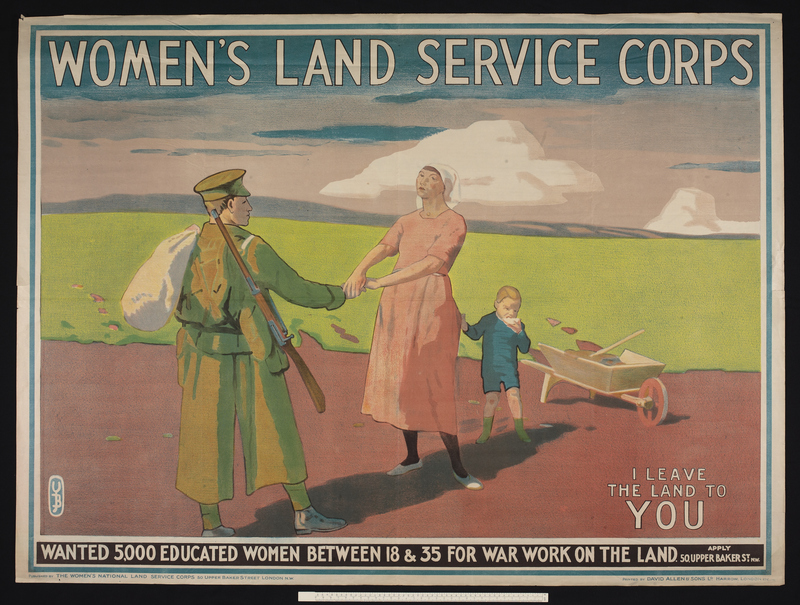 One poster in the collection for the Women’s Land Service Corps shows a man leaving the responsibility of the land to his wife. The overwhelming pinkness of the poster is perhaps intended to conflate the new workingwoman and traditional feminine attributes of the ideal Victorian woman. The strange, unreal aesthetic of this image is due to the attempt to combine these two views of women, which increasingly came to contradict each other throughout the war. The Girl Behind the Man Behind the Gun really had an unstable identity; was she strong or weak? Helpless or helpful? 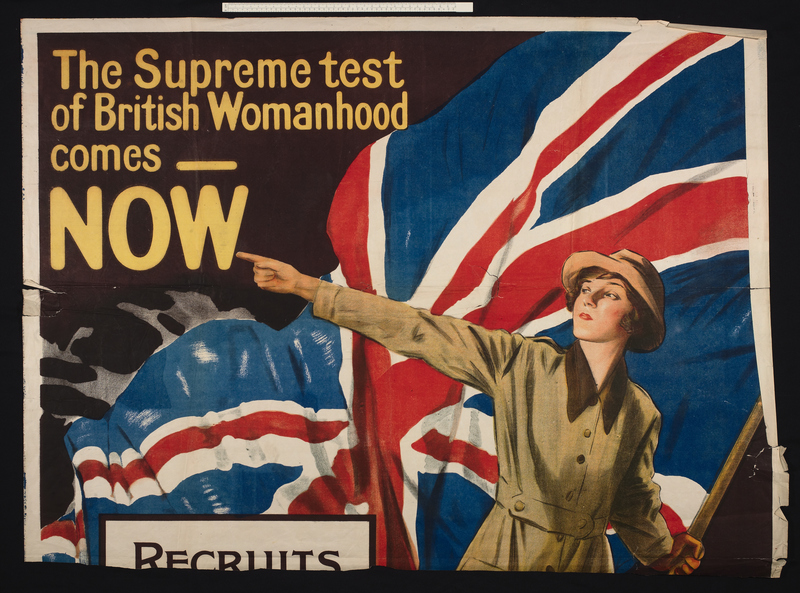 World War One posters alternated between these two contrasting ideas of ‘supreme British womanhood’, seeking to reconcile the irreconcilable. Images of women were a pivotal persuasive tactic employed by the printers of propaganda posters. Depictions of women were used both to encourage men to protect their homes but also to encourage women to embrace their new roles as modern working women.